I was on the Tiffany site earlier today, for one reason - I wanted to grab a few of my favorite Tiffany Rings and add them to my "Jewelry" board on Pinterest -- by the way, you should follow me on --> Pinterest here. 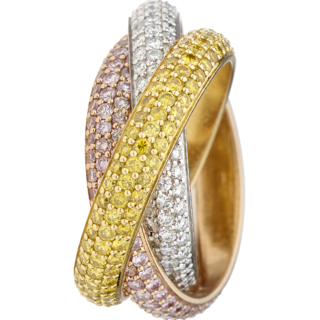 The jewelry I love, I have always loved. My taste, or style, rarely changes, which is a good thing, because if you want a $15,000 ring, at least you know you'll never grow tired of it. I mean you might not get it, but you won't grow tired of it. The rings vary in price, the cheapest is the Cartier Trinity (no diamonds), about $2000.00, the 5 band Etoile by Tiffany is $15K and the MOST expensive is the last ring, Cartier Trinity with all three bands encrusted with pave diamonds, approximately $70K. 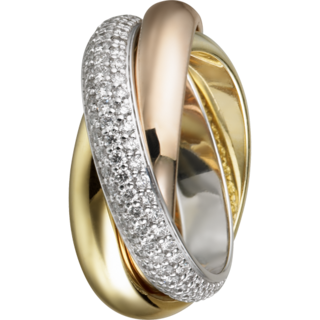 Cartier, I've always loved just one Cartier ring, but it is available in three different versions. I tried on the this last ring when I was in Las Vegas a few years back. 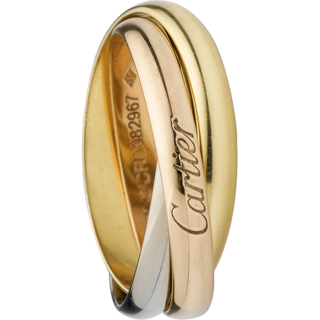 I walked into the Cartier Store and, unlike the Chicago store (where they can be a bit snooty), the gentleman in the Vegas store saw my gazing, walked over to me, opened the case and said, "try it on." I refused at first, he insisted and put the ring in my hand. At that point, how could I not put this lovely piece of craftsmanship on my pretty little finger? It must be good to be rich! Which ring do you like best? I love all your picks. Classics.